WASHINGTON – The shipments value of plastics machinery posted a moderate rise in the first quarter of 2015 when compared with the same period last year, according to statistics compiled and reported by SPI: the Plastics Industry Trade Association’s Committee on Equipment Statistics (CES). “Yet again, the quarterly CES shipments data posted a year-over-year gain. This is particularly encouraging in light of the slower-than-expected growth in the US economy to start the year. 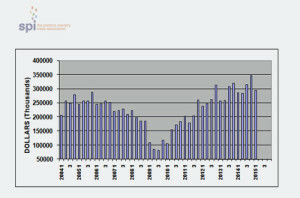 The U.S. economy will build momentum in the second half of 2015, and the market conditions that favor business investment in new equipment–low interest rates and rising aggregate demand–will continue to prevail,” according to Bill Wood, the plastics market economist who analyzes and reports on the plastics machinery market sector for the CES. Shipments of primary plastics equipment (injection molding, extrusion and blow molding equipment) for reporting companies totaled $293.6 million in Q1. This was a seasonal decline of 15.2 percent from the shipments total of $346.1 million in Q4 of 2014, but it was a gain of 2.9 percent when compared with the total from same quarter of a year ago. 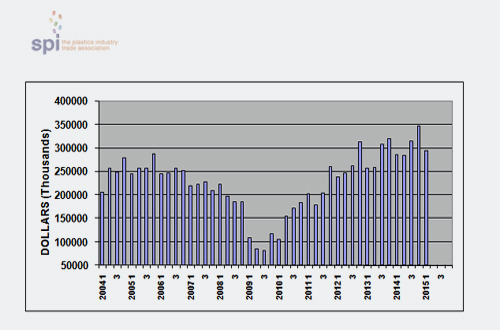 In 2014, the total annual value of primary equipment shipments escalated 7.6 percent. A breakout of the CES data shows that the shipments value of injection molding machinery advanced 1.4 percent in Q1 when compared with same quarter from last year. The shipments value of single-screw extruders increased 8.4 percent in Q1 over last year. The value of shipments of twin-screw extruders (includes both co-rotating and counter-rotating machines) gained less than 1 percent in Q1. The Q1 shipments value of blow molding machines jumped 19.4 percent. The CES also compiles data on the auxiliary equipment segment (robotics, temperature control, materials handling, etc.) of the plastics machinery industry. New bookings of auxiliary equipment for reporting companies totaled $105.4 million dollars in Q1. This was a gain of 6.9 percent when compared with the total from Q1 of last year. The growth in the CES data on plastics machinery shipments was only moderately slower than the gains in two major data series compiled by the U.S. government that measure demand for industrial machinery. According to the Bureau of Economic Analysis, total business investment in industrial equipment (plastics machinery is a subset of this data) increased by 6 percent (seasonally-adjusted, annualized rate) in Q1 when compared with the same quarter from last year. The other major industrial machinery market indicator, compiled by the Census Bureau, showed that the total value of new orders of industrial machinery also increased by 6 percent in Q1 when compared with the year before. “It is particularly encouraging that the data from the entire plastics industry held up quite well in Q1. The macro-indicators from the first quarter indicate that the rate of growth in the U.S. GDP data may have been negative. The good news is that consumer confidence levels are holding up, and accelerating economic growth is expected for the rest of the year. The three main trends that will drive both economic growth and demand for plastics products persist. They are: low interest rates, low energy prices, and rising wages and household incomes resulting from stronger employment levels,” said Wood. The CES also conducts a quarterly survey of plastics machinery suppliers that asks about present market conditions and expectations for the future. The responses from the Q1 survey indicate that machinery suppliers are optimistic about the market demand for their products in the coming months. In the coming quarter, 98 percent of the respondents expect conditions to either improve or hold steady. As for the next 12 months, 96 percent expect the market to be steady-to-better. There was a solid consensus that North America and Mexico are the global regions where the most promising market conditions for machinery suppliers are expected in the coming year. Expectations for Latin America and Asia call for mostly steady market conditions, though respondents are less optimistic about these two regions than they were last quarter. Expectations for Europe are mixed, and this outlook is mostly unchanged from Q4. As for the major end-markets, the respondents to the Q1 survey expect that automotive and packaging will remain strong in terms of demand for plastics products and equipment. Expectations for all other major end-markets call for firm market conditions to persist in 2015.